I have basically been very disconnected from movie news for the last few months, but I still try to at least keep up with the posters coming out whenever I can. This leads to some interesting moments when I find out a certain movie is being made by seeing its poster. Not having any other information regarding said motion picture, I’m able to experience it clean and form an opinion on the movie based only on the poster. In this particular case my reaction to the movie, based on the poster is: “What the f@$#, they are doing a Marmaduke movie? Really?”. 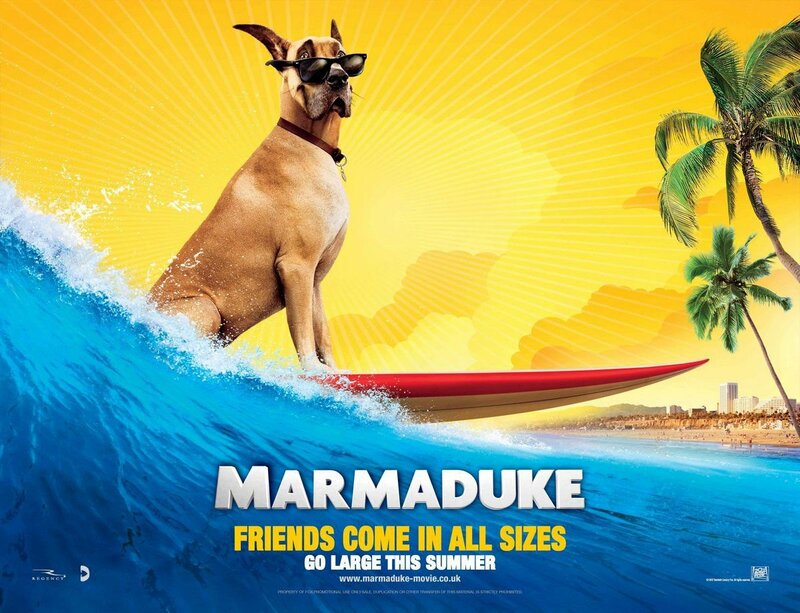 Upon further inquiry it seems they indeed are making a Marmaduke movie. One in which he surfs, apparently. Maybe if I see a trailer it will all make sense too me. But right now this seems like a classic example of taking a somewhat beloved property that is not cinematic in the least and trying to shoehorn it into a movie. Which will cost way more than it should. Could the poster have done a better job of selling the idea to me (or to someone more likely to enjoy this type of movie)? Maybe. But honestly, I’m not sure how. I think the rot in this case comes from the core idea of the film itself.